New koi, preferably from many different places including from unknown people and their koiponds can just be thrown in your pond .. But that's asking for trouble. And what if one of your koi is sick and you should treat it? Treat the entire pond or rather the one koi separate, controlled and with small amounts? For these reasons any koihobbyist that is serious about the hobby must build or obain a suitable quarantine tank. Fill the tank with pond water. Put some filtermaterial from your pond filter in the quarantine filter(Qfilter). Place a fish from your pond in the Qtan (the one that you are least attached to). Check the water every other day and slowly increase the temperature to the one your new fish are at at the dealer. (1 or 2 degrees per 24 hours). In case of ammonium or nitriet peeks, perform a water change with tap water that has the same temperature(pretty much) as the Qtank. Then you can get your fish and place it in the Qtank. Cover the Qtank to prevent jumping and provide some shelter. Keep monitoring the water quality and change if necessary, but at least 2 or 3 times a week 10%. Observe the fish well. If the koi show abnormal behaviour set a diagnose and act accordingly or make sure you contact someone who can like a Koi dokter. After a week showing normal behaviour slowly increase the 1 or 2 degrees per day to 22-24 degrees. Hold for at least 2 (preferably 4) weeks at this temp. If the fish after 1 week (preferably 2) still do perfectly, catch them and keep them in a non-watertight koinet about 30 seconds above water. This provides some stress and can act as a trigger for KHV. We would prefer a KHV outbreak in Qtank then later in the pond. Then give the fish some rest for another week (preferably 2) at 22-24 degrees. If no problems occur then the temperature can slowly be lowered to the pond temperature. Change the water with pond water in stead of tapwater (this way the fish get used to the composition of the pond water and the bacteria that might be new for the new fish). Throughout the Q period keep a strict one directional flow. There should never be material or water from Qtank in contact with your pond water. The qbak period can obviously be longer if the temperature of the pond is not above 15 degrees or simply if extra growth is aimed for. Transferring a fish at a temperature of 15 degrees is ideal. If the Qperiod has been completed succesfully, place the fish in the pond at dusk. Cover the pond or let the water level drop down a bit. The fish can start jumping in a foreign environment. Of course it's a terrible sight seeing your new koi besides the pond the next day. After a day or two the cover can go and the pond replenished. 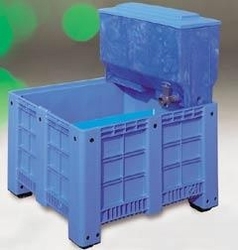 -A Qtank with a larger capacity (liters / m3) is more stable in temperature, water quality etc. and is therefore preferred. Less than 200 liters is a fishbowl for goldfish ..
A larger water volume is more stable in watervalues and temperature, but requires more heating. 1M3 is a nice size, more than 3m3 I call a pond. -Colours do make a big difference. A lot of stress will be seen in a yellow tank, in a black or blue tank koi wil be much calmer. And stress is a major factor! a stressed fish will worsen whatever condition it is in. -An air pump is not put on the edge, the vibrations give much noise underwater and the koi will want get headphones. Instead, put it in a place not physically attached to the Qtank. Hanging it from a rope also reduces the noise enormously. -Make sure you will not have cross contamination by using a dedicated nets, buckets etcetera.